Start in your freshman year of high school -- tenth grade at the latest. 99% of the time, the quality of your hours is more important than the quantity of your hours. Some programs specifically want to see that you've had extensive experience in the hospital environment. Such programs may look for applicants with 300 - 400 hours! Its important that when you start, be consistent. Set aside a few hours every week for volunteering. Try to volunteer at one or two hospitals without changing around too much; consistency and commitment are important. Make sure to document your volunteering history on your resume or curriculum vitae (CV). The BS/MD applications will request multiples letters of recommendation. Thus, it is important that you forge relationships with teachers, community leaders, doctors, or research mentors so that they could write about traits that cannot be seen from your resume. Every letter should talk about a different aspect of your character so that colleges can know you on a personal and professional level. Some recommenders could address how personable and empathetic you are while others could discuss your curiosity and perseverance. When selecting who will write your letters, make sure that they will address different aspects of who you are. Family should not write letters for you. It's needless to say but successful candidates do have the very best scores. The less competitive programs may require an SAT score as low as 1900 but the more competitive ones historically accept those with a 2200+. Some programs look at ACT scores as well depending on what part of the country you are from. Your GPA should be very competitive as many students will apply with a 90+ average. 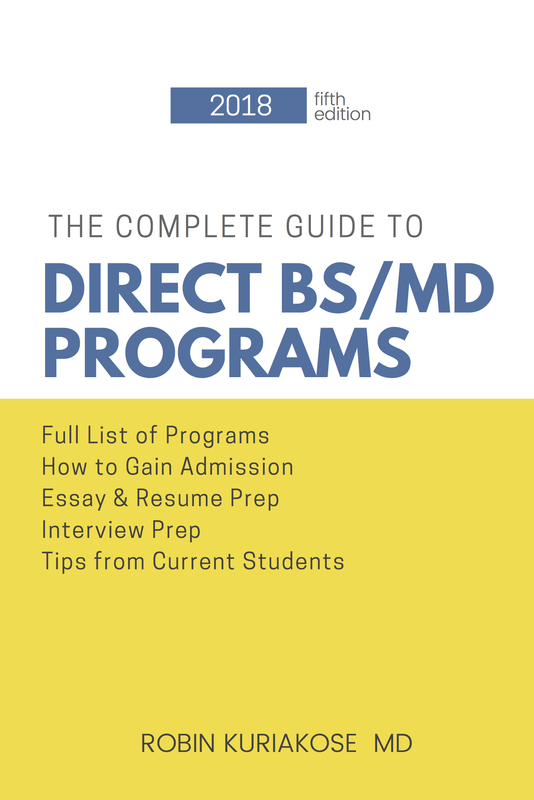 SATIIs should be taken in Math and Science and those scores should ideally be over 650+ (different programs want different SAT subject tests to be taken - if the information was provided by the college, then it is included in the next few pages that list all the current BS/MD programs). Consider enrolling in an SAT Preparation Company. Check out my blog where I reveal some information that can help guide you even more. I usually post concurrent to the admissions cycle so it is relevant to you! If you have any specific questions or concerns, drop me a line below and I can help answer them! Best of luck! We've published an updated book which you can download straight to your computer. Check it out HERE!